Welcome to February Free Bling Friday! Congratulations to Summer from Jacksonville for winning January's Free Bling! 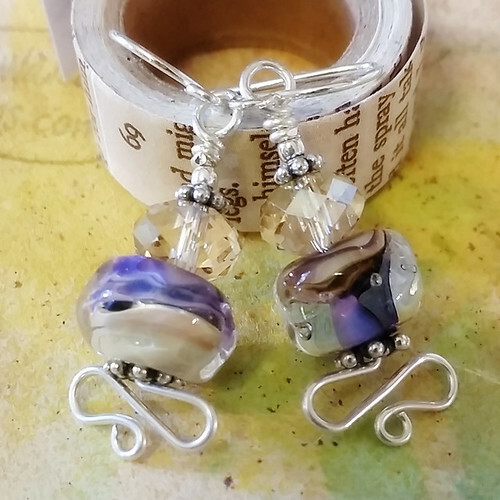 You may have seen this sweet little pair in this post, where I shared seven pairs of earrings I created in January as part of my 365 Somethings Project. They are petite handmade lamp work beads topped with Swarovski crystals and highlighted with sterling silver wire work and findings. To get your name in the hat, leave me your first name, city and state, and a way to contact you in the comments below no later than midnight ET Thursday, February 22. To avoid spam, write your email like happyshackdesigns at yahoo, etc., if you'd like me to contact you via email; if we are connected on Facebook or Instagram, just let me know your name or handle there and we're good! Share this post on Facebook or Twitter and post a separate comment with the link to the share for two entries. And if you haven't already subscribed to my monthly newsletter, click here to subscribe and you'll receive a reminder each month for Free Bling and one more way to enter. New to commenting on Blogger? At the very bottom of this post, you'll see a date (2/2/2018) and comments in hot pink. Click on the "comments" and a comment box will open. Open to U.S residents only. Please help me spread the word and share this post! Thanks for stopping in!